UC President Janet Napolitano will propose a 2.5 percent annual tuition increase of $282 for in-state students and an increase of $54 to the student services fee for all students, at the next UC Board of Regents meeting on Jan. 25-26. In-state tuition has not increased since the 2011-12 academic year, and out-of-state tuition has increased 8 percent annually for the past two years. Napolitano said this year’s proposed increase is needed to uphold current UC quality in the face of increased enrollment. 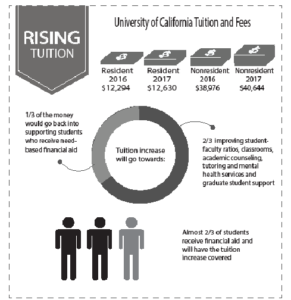 Proposed tuition hikes in 2015 were met with backlash from UC students. At UC Santa Cruz, students held multiple marches and demonstrations across campus and occupied the humanities buildings. Six students were also arrested for blocking Highway 17. Students from other UCs also demonstrated against the tuition hikes. This year, the Student Union Assembly (SUA) External Vice President Judith Gutierrez said UCSC students plan on protesting proposed tuition increases at the next UC Board of Regents meeting. Napolitano and Gov. Jerry Brown responded to the 2015 UC-wide demonstrations with a two-year in-state tuition freeze and an 8 percent annual out-of-state tuition increase. The state legislature granted the UC system $25 million of additional funding with the agreement that the UC system would enroll an additional 10,000 in-state students between 2016-18. This year’s proposed tuition increase will be half the rate of 2015’s 5 percent proposed increase. The increase will be covered for two-thirds of students, Napolitano said. “[UC] revenues have fallen behind increased expenses,” said Interim Executive Vice Chancellor Herbie Lee in an email. “The proposed tuition increase does not fully cover the expected increase in expenses,” but will help the university keep up with inflating costs after the six-year tuition freeze and help the UC’s heightened efforts to increase retention and graduation rates. The SUA External Affairs Office expressed the need for the quality of education to increase if the tuition increases. Gutierrez said quality of education and tuition are not consistent, so the SUA External Affairs Office will be calling for another freeze on tuition. The UC Office of the President (UCOP) said they plan on making an effort to keep the tuition increases affordable for low income students. One-third of the money garnered from the systemwide tuition hikes would go back into supporting students who receive need-based financial aid, according to UC Newsroom online. The remaining funds would go toward improving student-faculty ratios, classrooms, academic counseling, tutoring, mental health services and graduate student support. “If you are currently receiving financial aid, you don’t have to worry about applying the increase, and you will probably get more money than you’re already getting now, above and beyond that increase,” said Dianne Klein, press secretary for UCOP. State subsidies would increase to cover the tuition hike for all students from families making up to $156 thousand per year, and because financial aid can be used for purposes outside of tuition like housing, dining, books and transportation, “the lowest income students are really going to end up so called better off,” Klein said. Although students who receive financial aid would not be negatively affected by the tuition increase, the remaining in-state students and their families would have to find ways to pay for the increase in cost. Third-year Kylie Valencia takes out loans for all costs from tuition to living expenses. “College is already super expensive as it is, and for people who are in the middle class, I feel like we don’t get enough help, so the fact that it’s going to go up even more is pretty sad and, it’s not ideal,” Valencia said. The UC saved $420 million per year in procurement, insurance and energy and through outside donations to cover growing costs, in addition to increasing tuition. Donations to the university usually have designated purposes and therefore cannot be used for broader expenses, whereas tuition can. “Tuition needs to be as low as possible and it also needs to be predictable and we need to have generous financial aid for those students from lower income households and that is what we’re striving mightily to do,” said UC President Janet Napolitano.